A surprising number of businesses overlook the importance of customer safety. Ensuring customers have a safe experience while receiving services or making purchases is a critical aspect of good customer relations. Here are several sound practices that can be easily implemented to promote safety across every business transaction. Proper use of signs around your business can point out potential risks while shopping or waiting for a service. Signs should be placed in areas with high visibility, like entrances, exits, windows and doors. Automatic doors can pose a risk to patrons, so signs should be utilized to warn of potential closure if movement is not detected. Specific areas of a work site that could be harmful to customers should have signs to denote that only authorized personnel are permitted beyond a certain point. 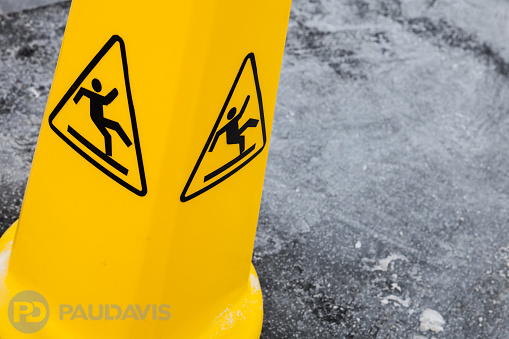 When cleaning floors, signs should be used to warn customers of the risks of walking across wet surfaces. To avoid injuries and lawsuits, it is important to make necessary repairs to damaged property as quickly as possible. This ensures customers are not at an increased risk. Examples of common property damage include water leaks, broken equipment, faulty flooring, and entrance accessibility. During an emergency situation, business employees should assist customers out of the property safely and efficiently. The business or storefront should be checked by staff to ensure no customers are left behind. Emergency exits should be clearly indicated with the use of signs or lights. It is easy for a customer to become injured by lifting a large, heavy object. Retailers selling these items should ensure customer safety by offering assistance. Businesses can eliminate customer injuries and product damage by identifying when customers are in need of assistance, and offer that assistance before customers attempt to lift items themselves. Shopping carts can be especially useful to customers and business owners in preventing personal injury. Steps are one of the biggest problem areas for customers looking to enter a business. Installing a ramp, adding handrails and considering an external platform lift that creates a separate entrance for disabled visitors are all simple solutions that require very little structural disruption and add to the business’s accessibility. Accidents happen often on staircases, particularly when customers are in a rush or carrying several bags. Provide a store exit that has ramps instead of stairs. Make sure all exits are well lit and suitably designed to allow for a flow of foot traffic as well as for disabled patrons. It’s not difficult to improve customer safety at any business. From signs to repairs and platform lifts, there are numerous options that will make your business space more attractive to targeted customer markets.